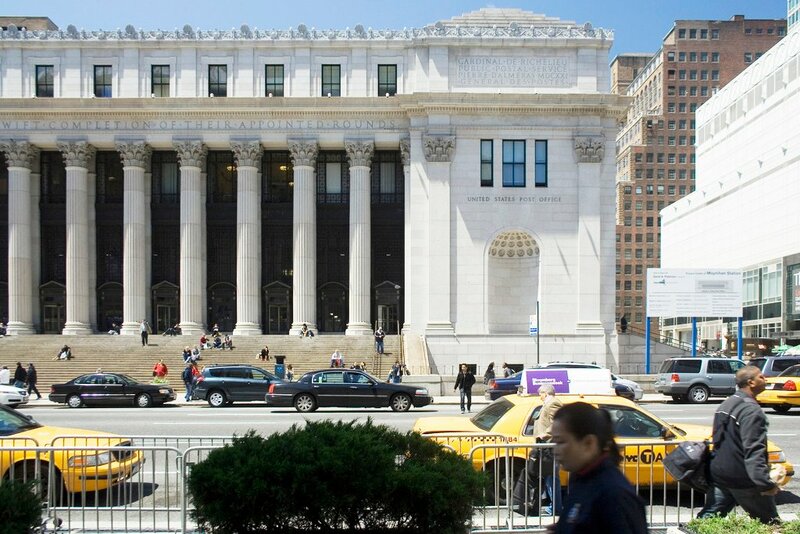 In 2005, the state selected the Related Cos. and Vornado Realty to oversee a $900 million redevelopment of the Penn Station-adjacent James A. Farley Post Office. The project, which came to be known as Moynihan Station, would have turned the full-block structure into an annex for Penn Station. The developers twice tried and failed to move Madison Square Garden into the space; they were also unsuccessful attracting a community college or CBS to the location. And after a promise to close this year on the deal was left empty, Governor Cuomo seems to have had enough. The New York Times reports that he and state officials met with Related and Vornado last week to voice frustrations about the long-stalled project and express the possibility that they’ll be replaced. A possible plan B is to move the 5,600-seat Theater at Madison Square Garden (currently located underground from the actual Garden) across 8th Avenue to the post office, thereby freeing up room in Penn Station for rail expansion and reconfiguration. As for now, Brookfield Properties and Extell Development have expressed interested in the project. The NYT article mentions that Extell and Brookfield would be interested in taking over the Penn Station development if Vornado and Related get the boot. Some sorry choices. Penn Station is desperately in need of redevelopment, yet at the same time stubbornly resistant to it. As it is, it’s an overused train and subway station that could be a deathtrap in any kind of fire or emergency–there’s no way to get all those hundreds and thousands of people out of the station quickly and safely.